Sacred Geometry at its finest. 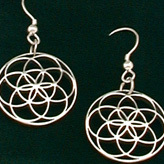 Sacred geometry is the study of symbology in mathematical form and construction. It is an endeavour towards knowledge and understanding of the basic rules of our universe. 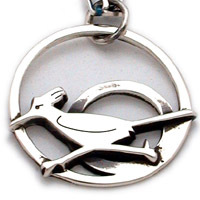 The Seed of Life is a classic geometrical figure simply constructed and understood. It dates from all ages and is even found inscribed at the Temple of Osiris at Abydos, Egypt, as well as other temple structures around the world. 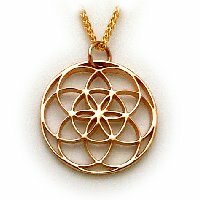 It is the center of a much larger diagram known as the Flower of Life, a fuller example of how distant things are related and still numerous. 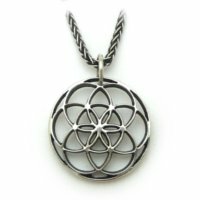 The sacred geometry in the pendant is a symbol of each individual aspect of creation and how they all spring from one single source - showing the relative interconnectedness of all things, multiplying, just as a cell "divides", when reproducing. We all share this bond. Each piece is accompanied by an 18" "Wheat Rope" chain, a genuine velvet gift box and a small descriptive pamphlet.